I must’ve been one of Onda’s early adopters. I discovered Vero Kern through Helg’s interview -- Helg was, I think, the first to introduce the new, über-niche Swiss house of Vero Profumo to the blogosphere. One of Vero’s scents was called Kiki, as a tribute to Kiki de Montparnasse, Man Ray’s muse and lover. It was my beloved cat’s name. I wrote Vero to ask for a sample. She generously offered me samples of all three of her scents, and after exchanging several e-mails and meeting in Paris, she gave me her friendship. Which makes it all the more difficult to write a review of Onda: not only was it authored by a friend (though I loved it before I came to know Vero better), but it’s also been reviewed in such poetic terms by so many excellent bloggers that one would wonder what’s left to say. 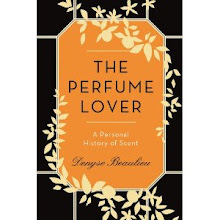 While Helg talks of “pre-lapsarian carnality”, Marina of Perfume-Smellin’ Things calls it “a comforting scent, an urban person's vision of bucolic utopia.” For Christopher of Vetivresse, it spans from “a conjured place of ritual, high-altitude sacrifice” to “rowdy, sweat-and-mud-caked high school locker room post-game rubdown”. But my favorite image is probably Tom’s, again on Perfume-Smellin’ Things: “It's Garbo joyfully tearing a root from the ground with her manicured fingers, brushing the dirt and laughing, biting in heedless of the juice that may stain her Adrian gown.” What’s not to love? Garbo laughs. What more can I say? Vero Kern’s perfumes have soul, and like souls, they’re full of sublime beauty and dirty secrets. Onda is about earth, flowers and flesh smeared in spicy honey. The honey and musk wrap the earthy notes of iris, patchouli, oakmoss and vetiver Bourbon in a human funk that makes you feel you’ve sunk your nose in the lustily worn and discarded garments of your lover – there is more than a hint of the petite culotte in there… Ginger and sandalwood heat up the mix, basil gives it an almost minty radiance. But the weird thing is, in the midst of this sticky, thick rush, cutting the density, a green floral note soars upwards hours into wearing Onda, and you are suddenly reminded of Diorissimo. So much so that you sniff around you to find out who could be wearing it, and it might be the old lady sitting next to you in the bus (after all, you’re riding smack past the house of Dior on the avenue Montaigne), but no, the muguet follows you home. Onda's secret is that single note of spring-like purity soaring out of the leathery brew -- a secret it shares with old-time fragrances: they almost always hide in their formulas a dollop of hydroxycitronellal, one of the oldest floral synthetics in the book, to open up the composition (see my post on the Great White Green Bubble). There's an unrelenting density to Onda that brings to mind vintage perfumery (Visa, Tabu, Shocking). Yet its syntax is different, deeply idiosyncratic. Somehow, the base is pushed to the top and Onda's evolution upends the classic pyramid: whatever's delicate in it hovers in the drydown. The phenolic honey -- push its concentration up a notch and it would smell like piss -- subsumes into its floral notes, and the ambery musk takes on the sweetly salty tinge of cat pads. Like all of Vero's compositions, Onda is only available in extrait. While I find it deeply compelling, because of its intensity, concentration and peculiarity, it is not, to me, an everyday scent -- much like my prized vintages: it requires too much attention to be worn in a casual way, though it is oddly comforting. But sometimes, when I open up my fragrance drawer, it calls me. When I does, I surrender to its earthy, sexual delights. Well, there you go. The answer to "why write about it when others have done so well"...is...none of them did what you did. I loved reading your take on Onda. i hope this isn't too off-topic, but i just gasped when i read you called your kitty 'kiki' after the famous model. my first kitty's 'official' name was namaste (i named her when she was a few weeks old). however, after she grew into her mature tortoishell mainecoon extravagant gorgeousness i found myself referring to her as 'kiki' more often than not. when sitting and viewed from the back, she was very curvy, putting me in mind of the famous photo of kiki de montparnasse from the back with the violin holes painted on her skin.....oh, i miss her. and i find myself observing that scentself has said what i was trying to think, but smarter and written more thoughtfully, for the second time in less than half an hour! it's very refreshing, thank you. i too look forward to your posts. D., Hats off to you. A stunning post, esp your remark re muguet. Vero's scents are at once Chinese boxes, Jamesian narratives and incredibly pure and sincere like Sophie Täuber-Arp artworks -- just never simple. And like the aforementioned, they usher us into not-so-simple situations where the question trumps the answer every time. 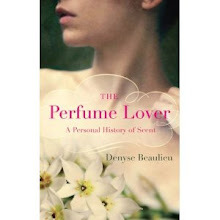 Scentscelf -- I had to try to rise to the challenge of all that good writing, didn't I? Do try Vero's fragrances: the samples are actually good value because they're so concentrated. A drop is literally enough! Lunarose, that's serendipitous! I named mine Kiki because I met the man who gave her to me at the wedding of a friend who'd written a biography of Kiki de M. He was a Flaubert specialist and I had settled on the name Salammbô, but when I saw her funny little face, I knew she had to be the impertinent Montparnasse-by-way-of-Burgundy muse! C., the muguet was an epiphany. I wrote to Vero to confirm that there was, in fact, muguet, and there was. I thought my nose was hallucinating: I've had Onda for over a year and had never noticed before. What you say is very true: pure, sincere but never simple is an excellent way of qualifying Vero's compositions. Jarvis, this structure thing is what you start perceiving beyond just "reading" the notes, right? It's only starting to appear to me more clearly, which opens up fascinating vistas. After reading this wonderful review I know I must try this. sometime. Thank you! Stella, there is poetry in perfume, why not metaphysics? I can't say I've read Heraclitus -- only saw some references in books, but I love the idea of the tiny green gem of physis. Maybe if Helg drops by she could elaborate, I'm sure she knows the pre-Socratics inside out. Oh wow. I'm in heaven today. Vetivresse reviews Guet Apens, The Shrine a vintage Guerlain and now, this. The Shrine's reviews sent me off to purchase samples from Vero Kern (and I must second your comment - they are generous samples given their strength)and Onda was my first love. It reminds me of the Rite of Spring (I'm sorry I have said this before). However I bought a bottle of Kiki because I came to love that too and it is a more wearable perfume for me in the sense that I can put it on and not forget it exactly but I'm not always thinking about it I'm just enjoying it. Onda is, to borrow a dear perfume friend's phrase, a commitment. Donanicola ps love lunarose's description of her beloved Kiki. I'd love a Mainecoon and a Turkish Van. I do adore my english moggies though! Donanicola -- I must rush to read the Guet-Apens review, it's a perfume I love dearly! About Onda, you're right, it's a commitment. I ended up getting both that and Kiki, which is an easier daytime wear and puts me in a great mood to boot! Aren't those big forest cats gorgeous? I have a thing for roundhead Siamese, but my love of felines is all-encompassing! I didn't know that artist, Stella. Thanks for the link (though I'll have to find something in a less Germanic language, I'm afraid...). And here I am to tip off my hat to you, dearest D, for a wonderful hommage to a great scent and the lovely woman who created it with so much passion and dedication (Vero, you rock!). As to Heraclitus/Heraklit on the subject of whom I am summoned ;-) First of all, I love the thinking behind that "bark" painting, dear S, and secondly, no wonder Denyse you haven't read him, because mysterious as he was in his own life he has only left us with a 100 fragments of cryptic sentences or so, surviving as ad hoc citations from authors of the AD years! It's a case of the less one says, the more important they should be. The body of his philosophy is analysed by contemporaries and followers (Cratylus mainly, as well as the Stoics and Pyrrhonists, notably Aenesidemus). The clashing of opposites and the flux of cosmos surely has some bearing on the creative process (in general) and from eternal battle comes human progress: Now there's an idea! Thanks Helg! Actually, I did remember a tiny fragment of Heraclitus, but perhaps the most important: "Panta rhei", "everything flows". Do you think this is the first time in history Heraclitus is evoked in relation to perfumery, or what? First off- you make me blush..
Second- I loved reading your take; I actually changed my mind about this one. I originally thought of it as something that I wouldn't wear. Having gone back to it however, I think it's just something that I would wear to en event: it's just not a flip-flops and shorts kind of scent..
A lovely review. I aspire to own more than a sample of Onda one day. Also--I love thinking about perfume in terms of structure and time as well as in terms of notes, but those multiple dimensions are difficult to articulate and you did so beautifully. And I'm always, always, glad to see Vero getting praise. Thanks Alyssa. Thinking in terms of structure was a conceptual leap for me -- it's already hard enough sometimes to pick out the notes without any training... But it's opening up a whole new dimension.